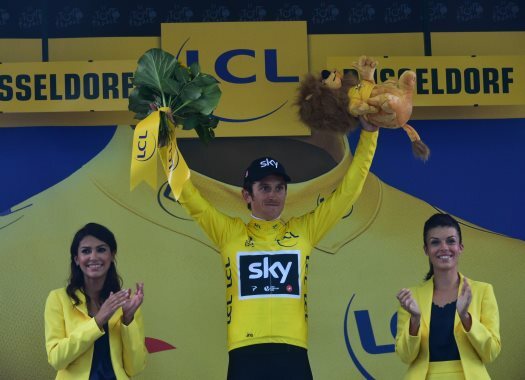 Photo of Geraint Thomas by the A.S.O. Geraint Thomas survived yet another day in the Tour de France and continued to lead the race with four stages left to go. The Team Sky rider was never in trouble in the short 17th stage, and even managed to leave his last remaining rivals behind in the last meters in order to take third place on the day. Behind him, Tom Dumoulin moved into second place at the expense of Thomas' teammate Chris Froome, who struggled in the last few kilometers. "It was a tough day," Thomas said. "I was feeling alright. It was a hard start to that last climb. Obviously (Nairo) Quintana went, (Primoz) Roglic chased, Froomey was with them. That may have forced Dumoulin to ride for a bit. And then it was really on. But then it settled down a little bit. I was feeling pretty good so I just reacted as soon as Roglic or Dumoulin moved and that's all I had to do. It was a pretty good day." The Welshman unveiled that Froome did have a plan to go for his own classification. "He wanted to try something so he went early with Roglic. I just assumed he was going to be good but he wasn't feeling too great towards the top. I think he's still third. I haven't seen anything but I think he's still up there." Although the main challenges between now and Paris are one more mountain stage and Saturday's time trial, Thomas still doesn't dare to dream about the final victory. "I don't let myself think about it. Honestly it's just day by day. Sprint day tomorrow, so rest now and get ready for that. "Obviously Dumoulin and Roglic, they were strong today, they were active and the closest to me along with Froomey. But I don't really classify him as a rival, being a teammate. So those two." Although Froome lost time on the day, Thomas doesn't think his teammate should be written off for the general classification battle. "I doubt it, he's a fighter. For sure he'll be fighting all the way. But it's good to keep that advantage for myself and the team are in a great position now."